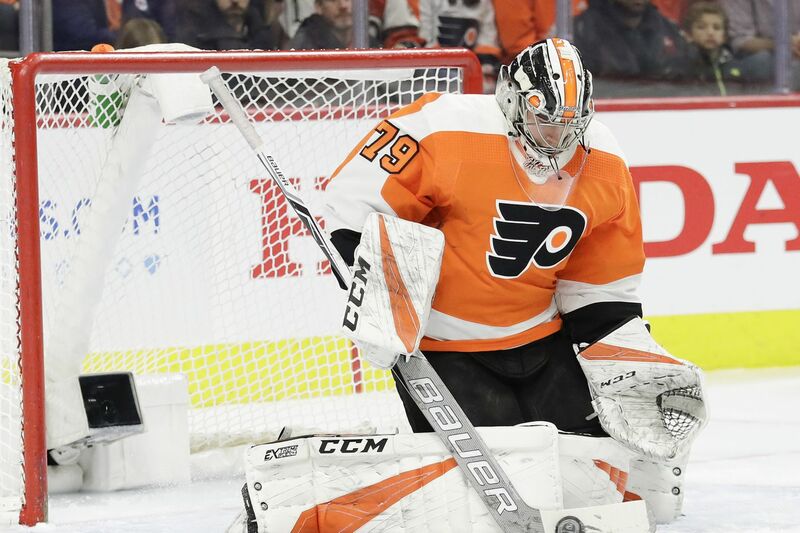 Flyers goaltender Carter Hart will make his seventh start in the last eight games Thursday in Boston. BOSTON -- Boston goalie Tuukka Rask will return from a concussion Thursday and try to contain the streaking Flyers. Rask (2.43 goals-against average, .919 save percentage) began his North American career in 2007-08 with Providence, whose AHL team was then directed by Scott Gordon, now the Flyers’ interim coach. The Flyers have won five straight, the NHL’s longest active winning streak. During the streak, they have scored 20 goals, tied with San Jose for the most in the league during that span. Hart, who is 7-5-1 with a 2.52 GAA and .922 save percentage, will make his seventh start in the last eight games for the Flyers. Gordon originally thought injured defenseman Shayne Gostisbehere would be able to play Thursday or Saturday against visiting Edmonton. He amended that after Thursday’s morning skate, saying Gostisbehere would not be ready to play until sometime next week, either Monday against Vancouver or Thursday against Los Angeles. Gostisbehere, who has what Gordon called a “bruise” that makes it difficult for him to push off, is plus-8 in his last six games. The Flyers recently started using a 1-3-1 forecheck in the neutral zone, switching form a 1-2-2. Defenseman Andrew MacDonald called it a work in progress, but said it was getting better each game. “I just felt we were giving up a lot off the rush. We weren’t confronting enough pucks on entries,” said Gordon, who also used the 1-3-1 with the Phantoms. Look for defenseman Ivan Provorov to be on the Flyers’ first power-play unit Thursday. The Flyers’ PP has clicked at just 12.9 percent, last in the NHL. The Bruins’ power play is second in the league (27.3 percent). Boston’s David Pastrnak has a league-high 14 power-play goals, which is only five fewer than the Flyers’ entire team. Travis Sanheim will play in his 100th career game Thursday. … Heading into Thursday, Claude Giroux needs to play in three games to move into third place in franchise history in games played. … Goalie Brian Elliott took part in the morning skate and the Flyers are hopeful he can play within two weeks. … Jake Voracek has 23 points in 27 career games against the Bruins. … Oskar Lindblom is tied for 13th among NHL rookies with 16 points. ... Returning to coach at TD Garden “has a buzz because it’s the town you grew up in,” Gordon said. ... Gordon said trade rumors have not affected Wayne Simmonds. “He has a great attitude,” he said.